Most of us believe that all kinds of herpes are caused by virus because medical books state so. We strongly mentioned that the PYRO-ENERGEN works for viral diseases. However, it seems that the PYRO-ENERGEN works only for a few cases of herpes. This is the reason that we came to the conclusion that most herpes cases are caused not only by virus but also by bacteria, fungi, pollutants, or other toxic elements. Our studies for herpes are still ongoing in order to find out the definite solution and to end herpes problems around the world. Sometime 35 years ago, I had a friend who suffered from genital herpes, so I recommended him to have PYRO-ENERGEN therapy. Amazingly, his long years of hardship in combating his herpes were gone completely! Almost the same year, I had an electronics technician who was suffering from genital herpes, too. I also recommended him to have PYRO-ENERGEN therapy because of our previous experience of treating the same disease. He used the PYRO-ENERGEN machine for two months. However, his herpes did not disappear and got worse. I had no choice but to let him go for vacation leave for a while with pay. He went to his birthplace where his parents live. After about 40 days, he came back to us to work again. And guess what, his herpes was gone during his vacation leave! Our experience with PYRO-ENERGEN therapy shows that there are herpes caused by virus alone. In these cases, results appear wonderfully after PYRO-ENERGEN therapy, since from the day you use the machine, good effects can be readily observed by the patients. With other cases of herpes, the PYRO-ENERGEN treatment shows no effect at all. This is when we realized that there must be more than two types of herpes. One is caused by virus alone, which can be treated by the PYRO-ENERGEN. The other type of herpes may be caused by other than a virus since the PYRO-ENERGEN therapy has no effect at all. Now, I just came to wonder how my former technician got well after taking a long vacation. During my interview with him, he mentioned that he only took a vacation, nothing special. We know that old Japanese folks advice asthma patients to relocate their lodgings in the province. We notice that they get well thereafter. However, as soon as they return home, asthma will recur among the majority of them. I came to think that there must be some relation or similar occurrences between asthma and herpes. And I think I found one, which is STRESS. Both herpes and asthma patients look fine with no signs of their illness getting worse as long as they are happy without family and financial problems. From these experiences, I tried to seal herpes patients from their financial and family problems when they come for help. As much as I can accommodate their needs when I can afford, I send them to my vacation cabin in the province for them to enjoy fishing, planting flowers or vegetables, feeding cattle, etc. Now, you may ask, where did the herpes virus come from then? The answer is simpler than you think. As we mentioned in our website, viruses are complex molecules of protein and nucleic acid, resembling genes. All of us have protein and nucleic acid in our body, and an unknown energy forces a change in the cell's chemistry, then toxic virus is produced causing herpes. I believe that a certain stress produces energy wave that assembles protein and nucleic acid to form such virus. Particularly, this virus may not be the same as the virus created by the negative energy or dark energy. Is it not the reason that PYRO-ENERGEN therapy may not work to such herpes patients? It is because there is no outside energy force that assembles the toxic virus in the body. Yes, the energy must be coming from your own brain wave. Amylase will increase when stressed. Stress is bad in nature and has no symptoms. Whether it is correct or not, stress can be measured by the digestive enzyme amylase found in your saliva. A litmus paper can simply tell you by showing its yellowish color. We also notice that when your stress level is high, the herpes is also active. Stress levels can be measured simply in this way every day at home. Fatigue, toxic pollutants, bacteria, and fungus, may cause herpes, too. Also one of our researchers told us about chickenpox being caused by a herpes virus, which you may have experienced during childhood. The virus however, does not leave the body even after an individual recovers from chickenpox. The virus hibernates and remains dormant in the body. The reason for this remains a mystery. When you are stressed, the herpes virus may reawaken. From this theory, anyone who was once infected with chickenpox is more prone to herpes. No wonder that the herpes virus did not come from anywhere but was staying within your body in a dormant state for decades. What happened was that stress acted as a trigger device. It is not recommended to use ointments. 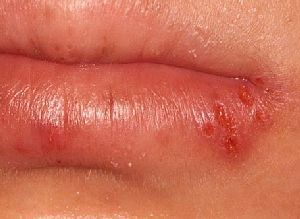 Only apply alcohol and vinegar externally for herpes. There are some herbs that are effective against herpes according to some medical teams. We will try to gather their information as soon as possible. Your suggestions are welcome.